Nahuatl (English: /ˈnɑːwɑːtəl/;  Nahuatl pronunciation: [ˈnaːwatɬ] ( listen)), [cn 1] known historically as Aztec,  is a language or group of languages of the Uto-Aztecan language family. Varieties of Nahuatl are spoken by about 1.7 million Nahua peoples, most of whom live in central Mexico. Nahuan languages exhibit a complex morphology characterized by polysynthesis and agglutination. Through a very long period of coexistence with the other indigenous Mesoamerican languages, they have absorbed many influences, coming to form part of the Mesoamerican language area. Many words from Nahuatl have been borrowed into Spanish and, from there, were diffused into hundreds of other languages. Most of these loanwords denote things indigenous to central Mexico which the Spanish heard mentioned for the first time by their Nahuatl names. English words of Nahuatl origin include " avocado", " chayote", " chili", " chocolate", " atlatl", " coyote", " peyote", " axolotl" and " tomato". As a language label, the term "Nahuatl" encompasses a group of closely related languages or divergent dialects within the Nahuan branch of the Uto-Aztecan language family. The Mexican Instituto Nacional de Lenguas Indígenas (National Institute of Indigenous Languages) recognizes 30 individual varieties within the "language group" labeled Nahuatl. The Ethnologue recognizes 28 varieties with separate ISO codes. Sometimes the label also is used to include the Pipil language (Nawat) of El Salvador. Regardless of whether "Nahuatl" is considered to label a dialect continuum or a group of separate languages, the varieties form a single branch within the Uto-Aztecan family, descended from a single Proto-Nahuan language. Within Mexico, the question of whether to consider individual varieties to be languages or dialects of a single language is highly political. This article focuses on describing the general history of the group and on giving an overview of the diversity it encompasses. For details on individual varieties or subgroups, see the individual articles. In Mesoamerica the Mayan, Oto-Manguean and Mixe–Zoque languages had coexisted for millennia. This had given rise to the Mesoamerican language area ("language area" refers to a set of language traits have become common among the area's languages by diffusion and not by evolution within a set of languages belonging to a common genetic subgrouping). After the Nahuas migrated into the Mesoamerican cultural zone, their language too adopted some of the traits defining the Mesoamerican Linguistic Area. Examples of such adopted traits are the use of relational nouns, the appearance of calques, or loan translations, and a form of possessive construction typical of Mesoamerican languages. Boas, Franz (1917). "El dialecto mexicano de Pochutla, Oaxaca". International Journal of American Linguistics (in Spanish). 1 (1): 9–44. doi: 10.1086/463709. OCLC 56221629. Bright, William (1990). " 'With One Lip, with Two Lips': Parallelism in Nahuatl". Language. 66 (3): 437–452. doi: 10.2307/414607. JSTOR 414607. OCLC 93070246. Campbell, Lyle; Langacker, ronald (1978). "Proto-Aztecan vowels: Part I". International Journal of American Linguistics. 44 (2): 85–102. doi: 10.1086/465526. OCLC 1753556. Canger, Una (1988). "Nahuatl dialectology: A survey and some suggestions". International Journal of American Linguistics. 54 (1): 28–72. doi: 10.1086/466074. OCLC 1753556. Dakin, Karen; Wichmann, Søren (2000). "Cacao and Chocolate: A Uto-Aztecan Perspective" (PDF). Ancient Mesoamerica. 11 (1): 55–75. doi: 10.1017/S0956536100111058. OCLC 88396015. Archived from the original ( PDF online reprint) on 8 April 2008. Flores Farfán, José Antonio (2002). Barbara Jane Burnaby; John Allan Reyhner (eds.). The Use of Multimedia and the Arts in Language Revitalization, Maintenance, and Development: The Case of the Balsas Nahuas of Guerrero, Mexico ( PDF). Proceedings of the Annual Conference on Stabilizing Indigenous Languages (7th, Toronto, Ontario, Canada, 11–14 May 2000). Flagstaff, AZ: Center for Excellence in Education, Northern Arizona University. pp. 225–236. ISBN 978-0-9670554-2-8. OCLC 95062129. Fowler, William R. Jr. (1985). "Ethnohistoric Sources on the Pipil Nicarao: A Critical Analysis". Ethnohistory. 32 (1): 37–62. doi: 10.2307/482092. JSTOR 482092. OCLC 62217753. Hill, Jane H. (2001). "Proto-Uto-Aztecan: A Community of Cultivators in Central Mexico?". American Anthropologist. 103 (4): 913–934. doi: 10.1525/aa.2001.103.4.913. OCLC 192932283. INALI, [Instituto Nacional de Lenguas Indígenas] (14 January 2008). "Catálogo de las lenguas indígenas nacionales: Variantes lingüísticas de México con sus autodenominaciones y referencias geoestadísticas" ( PDF online facsimile). Diario Oficial de la Federación (in Spanish). 652 (9): 22–78 (first section), 1–96 (second section), 1–112 (third section). OCLC 46461036. INEGI, [Instituto Nacional de Estadísticas, Geografia e Informática] (2005). Perfil sociodemográfica de la populación hablante de náhuatl (PDF). XII Censo General de Población y Vivienda 2000 (in Spanish) (Publicación única ed.). Aguascalientes, Mex. : INEGI. ISBN 978-970-13-4491-0. Archived from the original ( PDF) on 2 October 2008. Retrieved 2 December 2008. Kaufman, Terrence; Justeson, John (2009). "Historical linguistics and pre-columbian Mesoamerica". Ancient Mesoamerica. 20 (2): 221–231. doi: 10.1017/S0956536109990113. Kaufman, Terrence; Justeson, John (2007). "Writing the history of the word for cacao in ancient Mesoamerica". Ancient Mesoamerica. 18 (2): 193–237. doi: 10.1017/s0956536107000211. Kaufman, Terrence (2001). "The history of the Nawa language group from the earliest times to the sixteenth century: some initial results" ( PDF). Revised March 2001. Project for the Documentation of the Languages of Mesoamerica. Retrieved 7 October 2007. Knab, Tim (1980). "When Is a Language Really Dead: The Case of Pochutec". International Journal of American Linguistics. 46 (3): 230–233. doi: 10.1086/465658. OCLC 1753556. Lockhart, James; Berdan, Frances F.; Anderson, Arthur J.O. (1986). The Tlaxcalan Actas: A Compendium of the Records of the Cabildo of Tlaxcala, 1545-1627. University of Utah Press. ISBN 978-0-874-80253-5. : Macri, Martha J. (2005). "Nahua loan words from the early classic period: Words for cacao preparation on a Río Azul ceramic vessel". Ancient Mesoamerica. 16 (2): 321–326. doi: 10.1017/S0956536105050200. OCLC 87656385. Macri, Martha J.; Looper, Matthew G. (2003). "Nahua in ancient Mesoamerica: Evidence from Maya inscriptions". Ancient Mesoamerica. 14 (2): 285–297. doi: 10.1017/S0956536103142046. OCLC 89805456. Merrill, W. L.; Hard, R. J.; Mabry, J. B.; Fritz, G. J.; Adams, K. R.; Roney, J. R.; Macwilliams, A. C. (2010). "Reply to Hill and Brown: Maize and Uto-Aztecan cultural history". Proceedings of the National Academy of Sciences. 107 (11): E35–E36. Bibcode: 2010PNAS..107E..35M. doi: 10.1073/pnas.1000923107. PMC 2841871. Pharao Hansen, Magnus (2010). "Polysynthesis in Hueyapan Nahuatl: The Status of Noun Phrases, Basic Word Order, and Other Concerns" (PDF). Anthropological Linguistics. 52 (3): 274–299. doi: 10.1353/anl.2010.0017. Rincón, Antonio del (1885) . Arte mexicana compuesta por el padre Antonio Del Rincón de la compañia de Jesus: Dirigido al illustrissimo y reverendissimo s. Don Diego Romano obispo de Tlaxcallan, y del consejo de su magestad, &c. En Mexico en casa de Pedro, Balli. 1595 ( PDF facsimile, University of Chicago Library digital collections) (in Spanish) (Reprinted 1885 under the care of Dr. Antonio Peñafiel ed.). México D.F. : Oficina tip. de la Secretaría de fomento. OCLC 162761360. Whorf, Benjamin Lee; Karttunen, Frances; Campbell, Lyle (1993). "Pitch Tone and the 'Saltillo' in Modern and Ancient Nahuatl". International Journal of American Linguistics. 59 (2): 165–223. doi: 10.1086/466194. OCLC 1753556. Wolgemuth, Carl (2002). 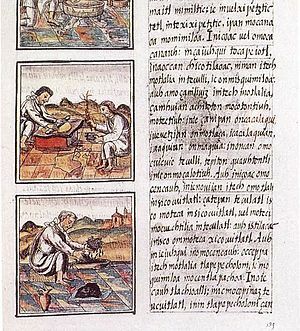 Gramática Náhuatl (melaʼtájto̱l): de los municipios de Mecayapan y Tatahuicapan de Juárez, Veracruz. Sharon Stark and Albert Bickford (online eds.) (2nd ed.). México D.F. : Instituto Lingüístico de Verano. ISBN 978-968-31-0315-4. OCLC 51555383. Archived from the original ( PDF online edition) on 19 April 2008. Retrieved 3 October 2007.